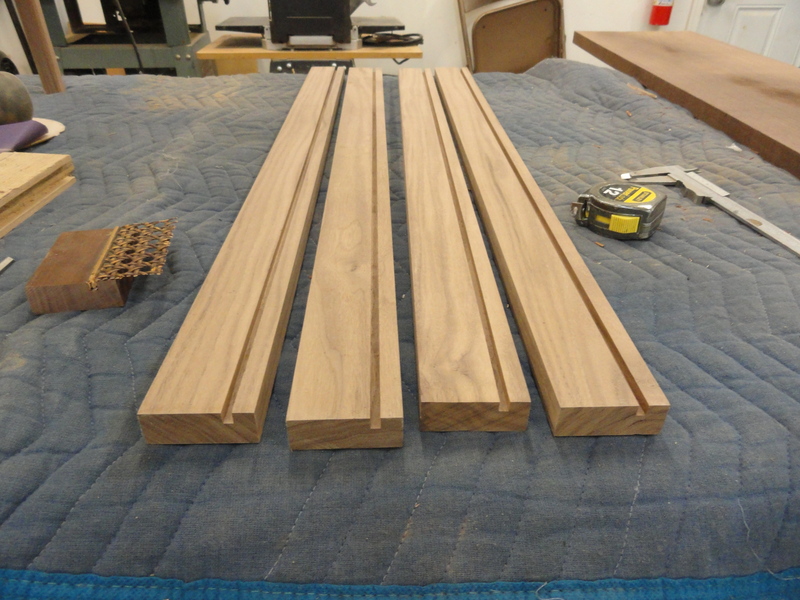 I went to the mill and purchased a 4/4 rough cut piece of walnut. 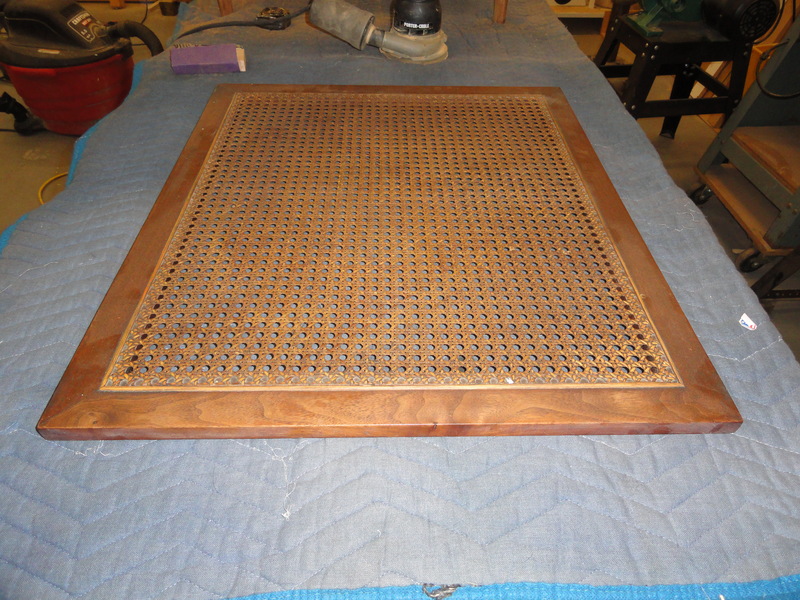 $8.95 per board feet…Whew!!!! 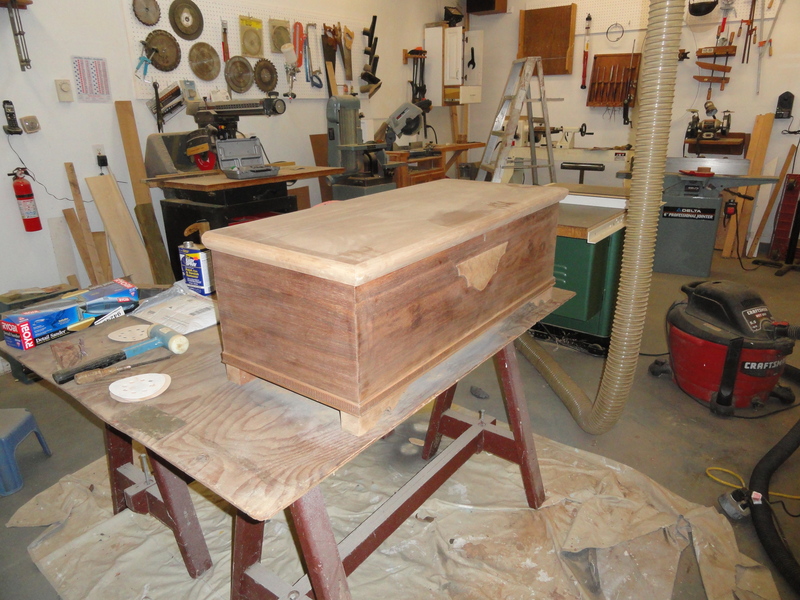 Making a new shelf is much faster than digging out the old canning and refinishing the wood. 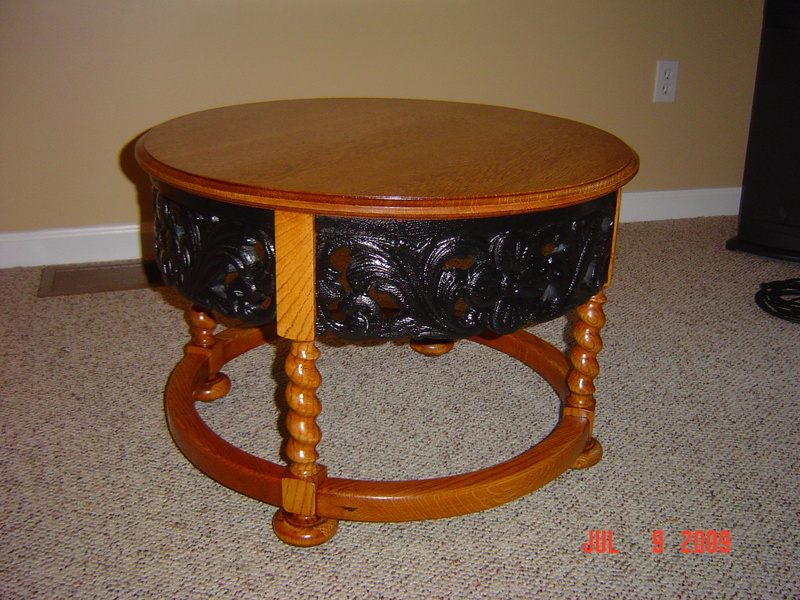 My father built this coffee table when I lived in Racine, Wisconsin. My mother told me that I was less than one years old. This makes the table over 50 years old. 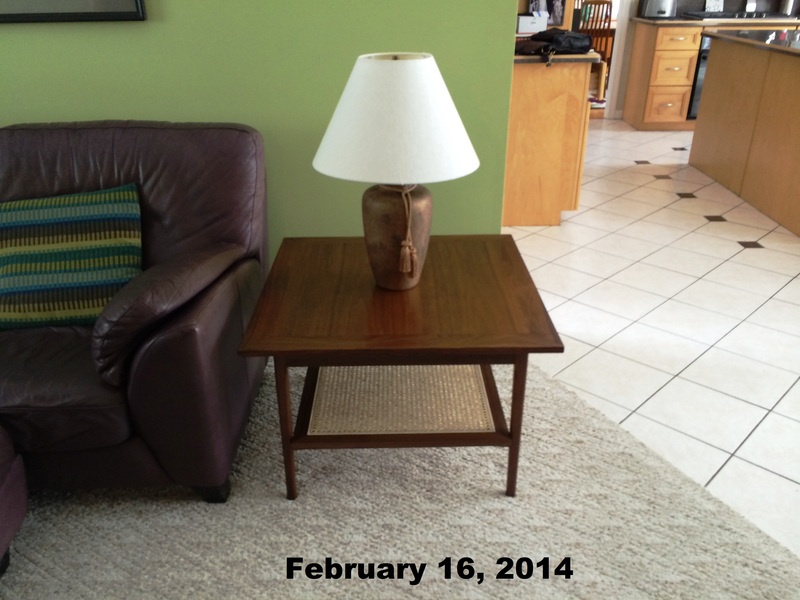 When my father passed away, my older sister inherited the table and it has been in her living room ever since. 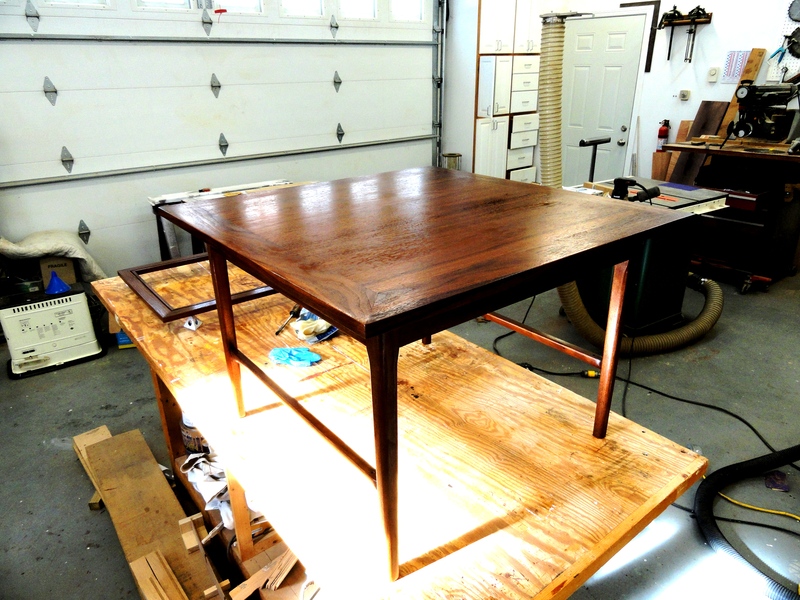 Recently, she asked me to refinish the table. 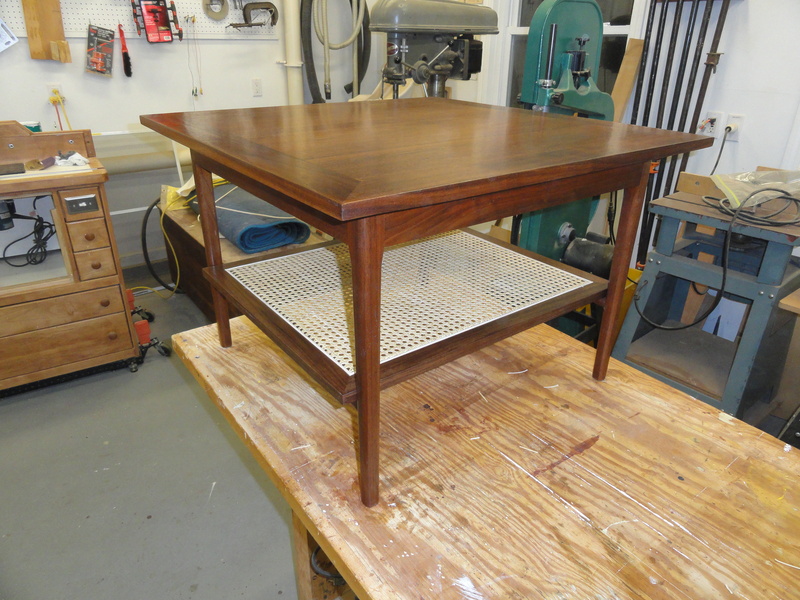 It had 40 years of wear and tear on the finish, however, it is made from walnut and the wood is in pretty good shape. 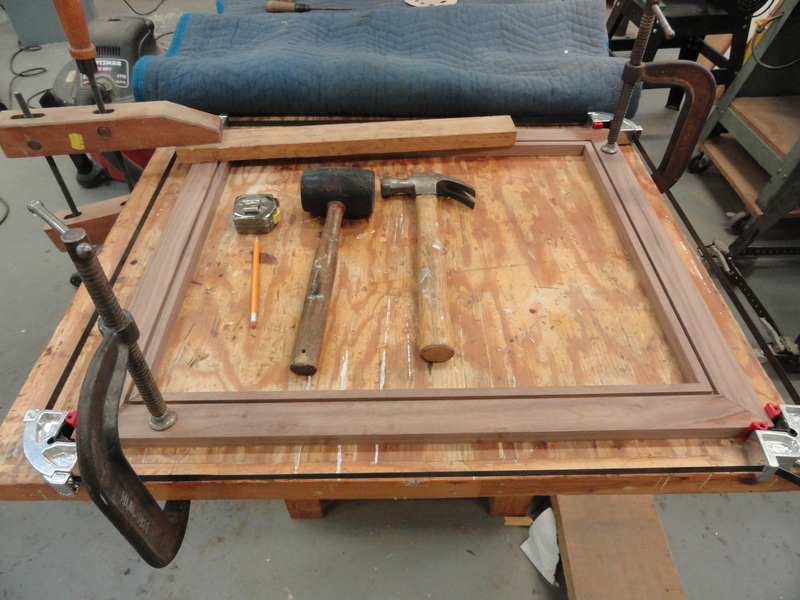 I tried to completely disassemble the table, unfortunately the base is glued to the frame. Why my father did this I don’t know. 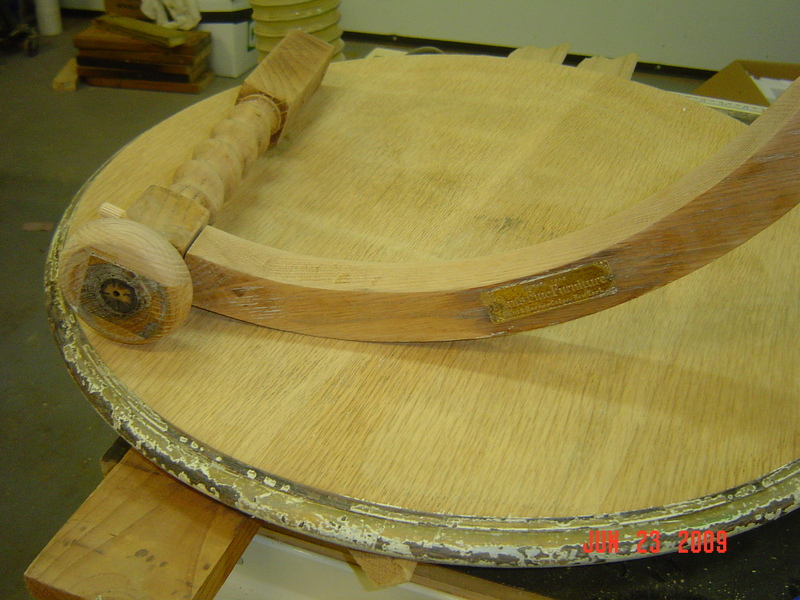 Further, upon inspection of the construction, the center section of the walnut top appears to be a wood laminated piece of plywood salvaged from some other piece of furniture. 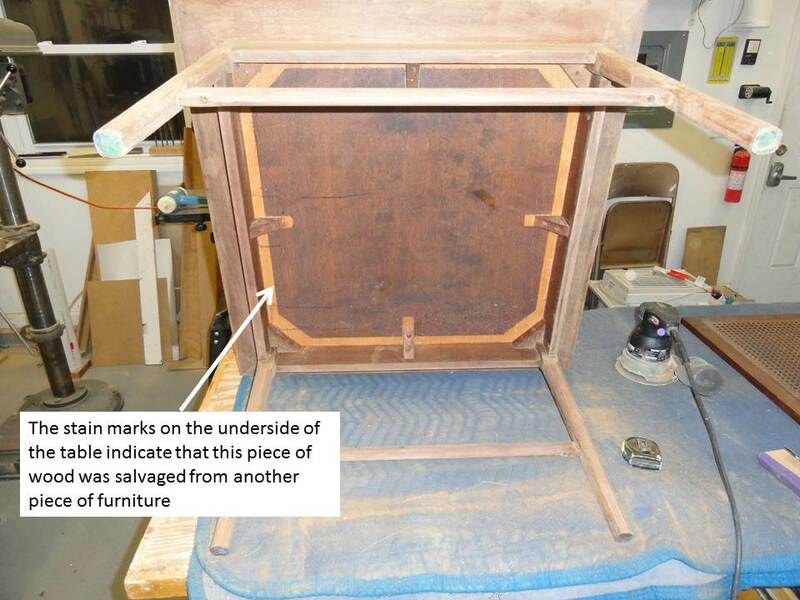 There are stain marks on the underside that clearly show it had once belonged to another piece of furniture. 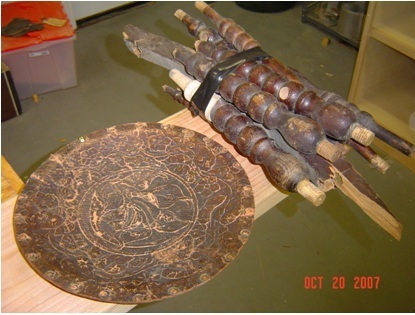 The picture shows lower shelf disassembled from the frame. 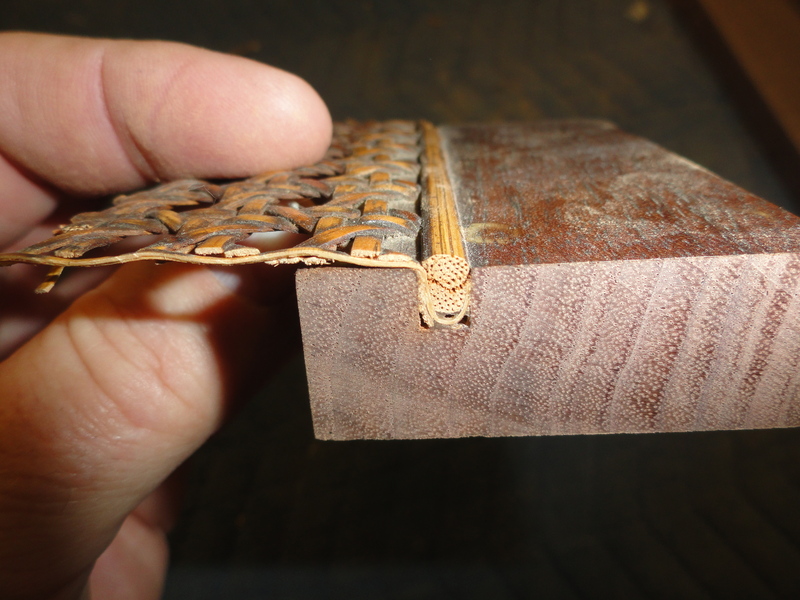 It has very interesting caning and I am trying to decide what I am going to do with this. Last night I tried to remove the caning. 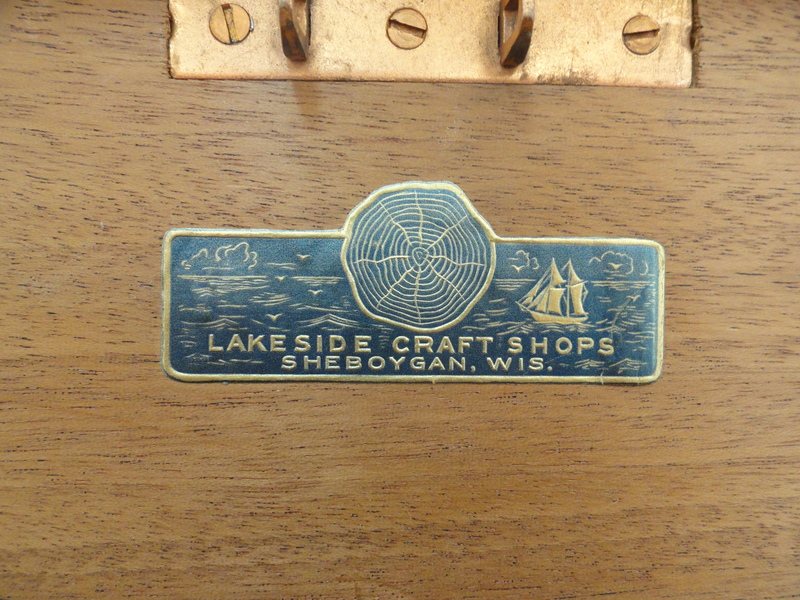 It is too old and looks like my father used a lot glue. 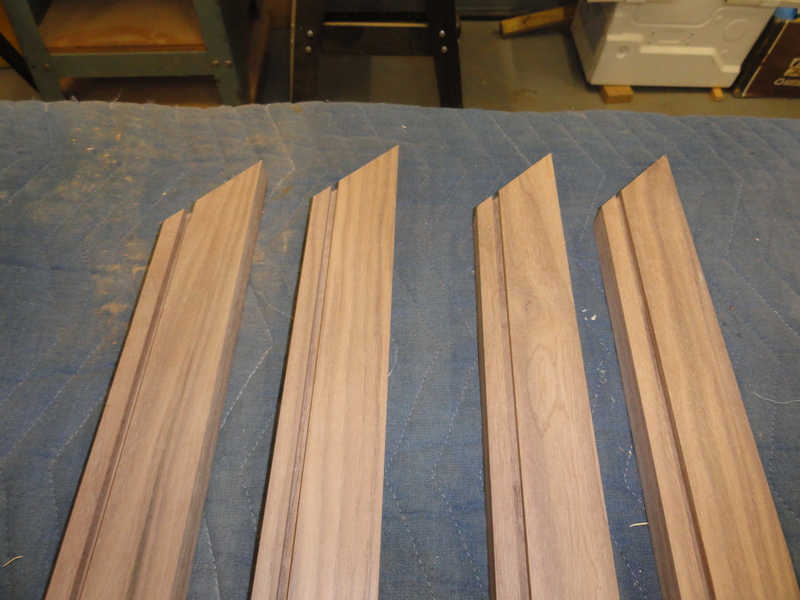 The quality of the miter joints is not that good. 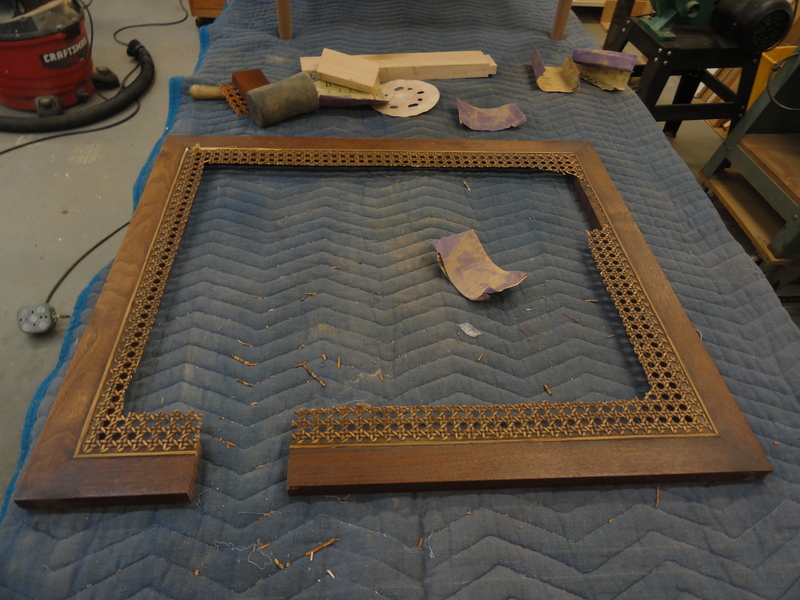 I will probably replace the wood frame rather than salvage it. 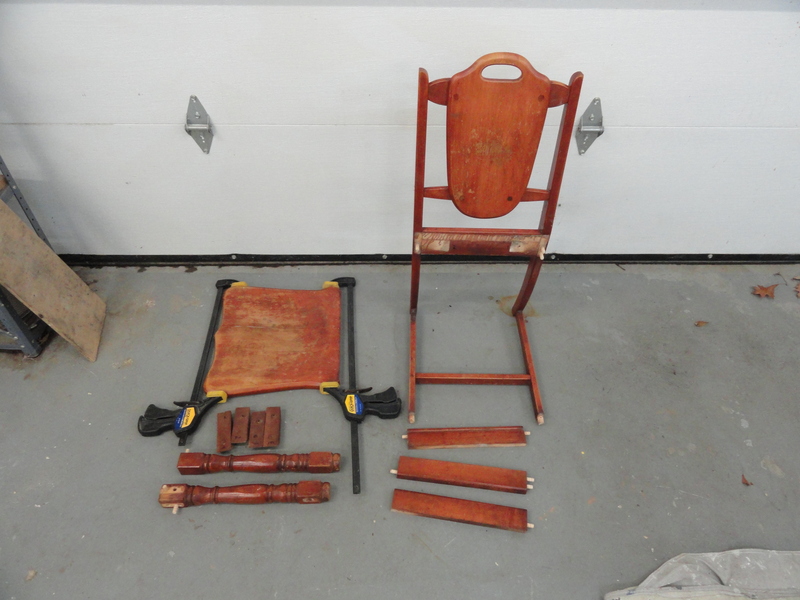 I have to decide if I am going to attempt to replace the caning or do something different. 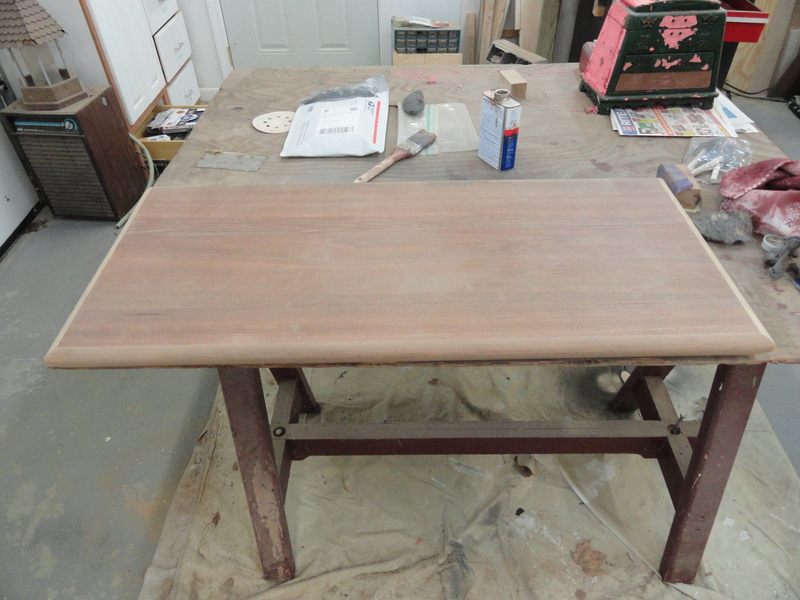 I have stripped the finish and rough sanded most of the wood. All surfaces are in good shape. 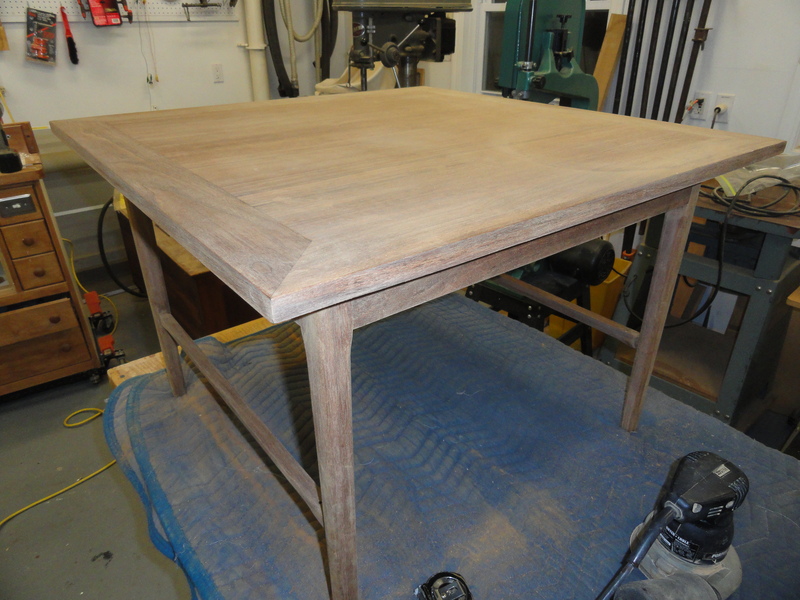 I expect to have the entire table fully finished sanded in a couple of weeks. 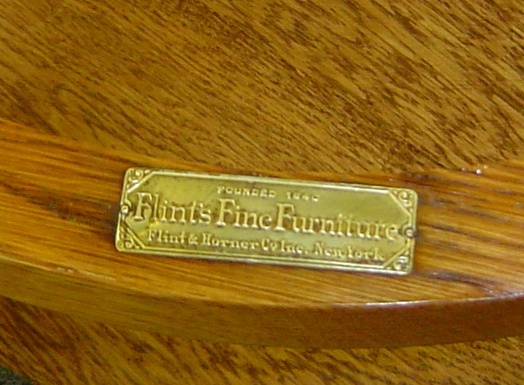 I am not sure what I am going to do with the cane shelf. 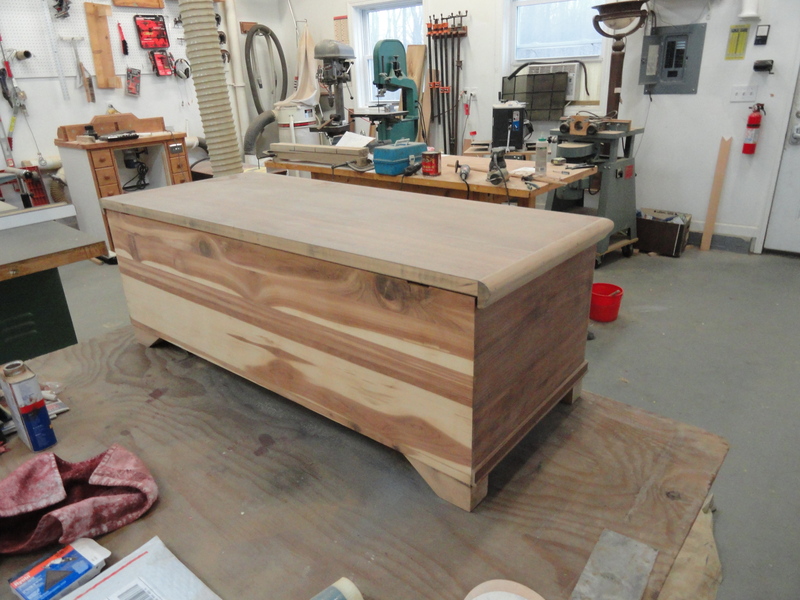 I finished the cedar chest quit a while ago, however, I did not post the completed project because Amy is going to get surprised Christmas morning! 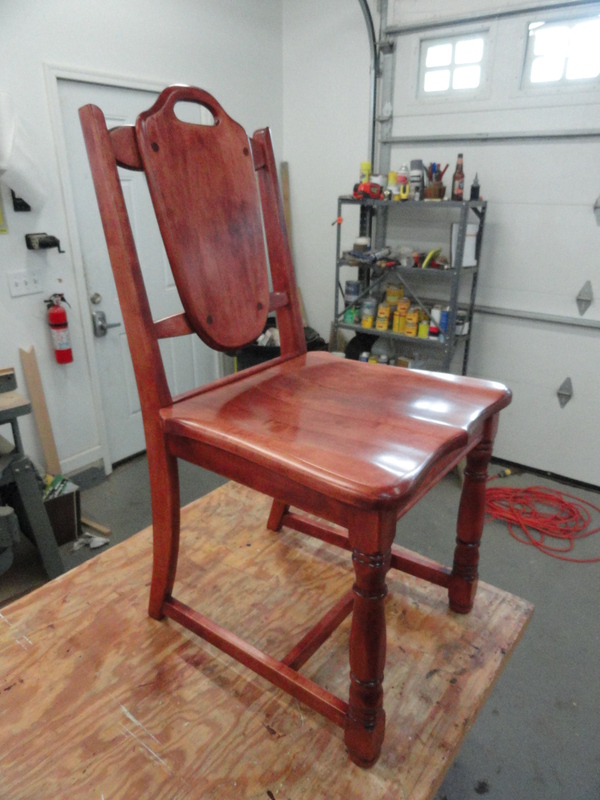 I decided on a satin urethane finish. 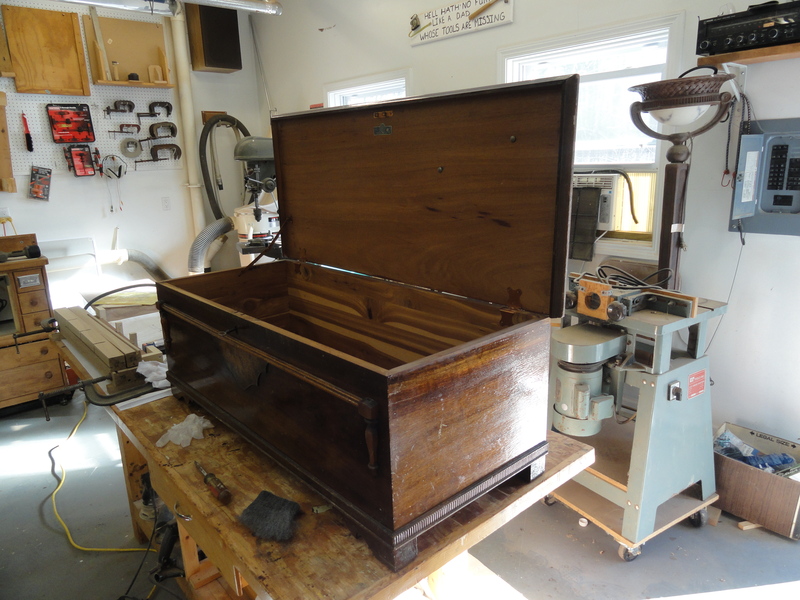 I just could not bring myself to put a glossy coat of shellac on the walnut veneer. It just did not seem like the right thing to do. No one, including myself, like the first leg (shown in the last post). 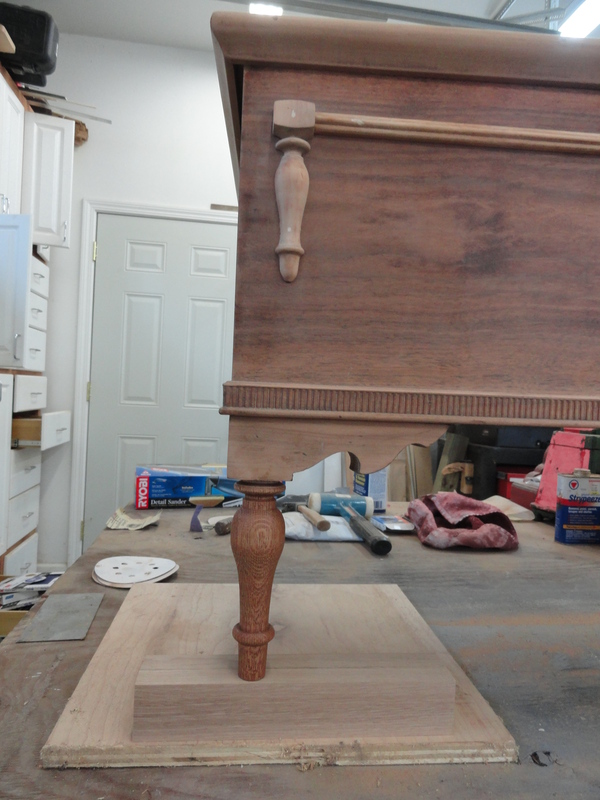 The square block on the top of the leg did not seem to look correct against the square bottom where the leg mounts. This morning, I machined off the square block. 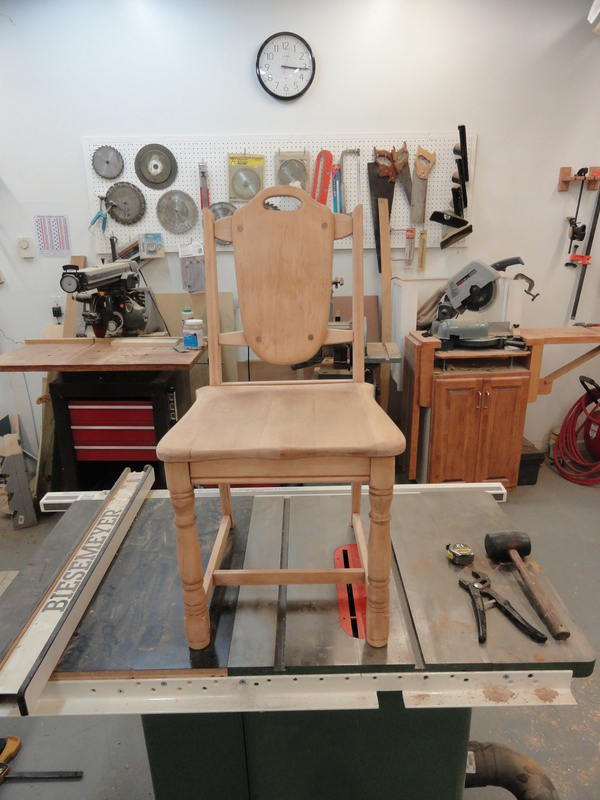 It only took about 5 minutes and it eliminated the most difficult part about turning the leg. My sister like the new look of the leg. I will refine the design one more time and start turning all four legs. I will be off-line for the next couple of weeks. 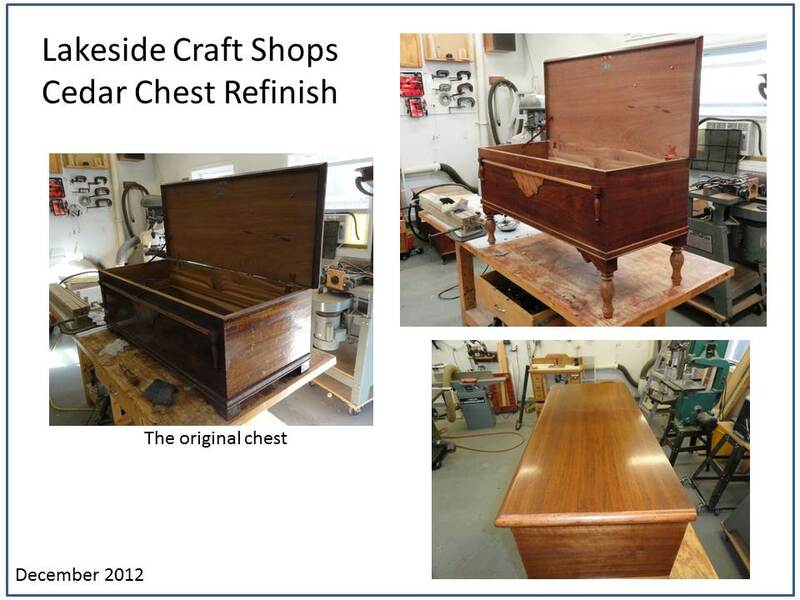 As I stated in my previous post, the pictures I found of the cedar chests manufactured by the Lakeside Craft Shops showed fancy turned spindles that act as feet. 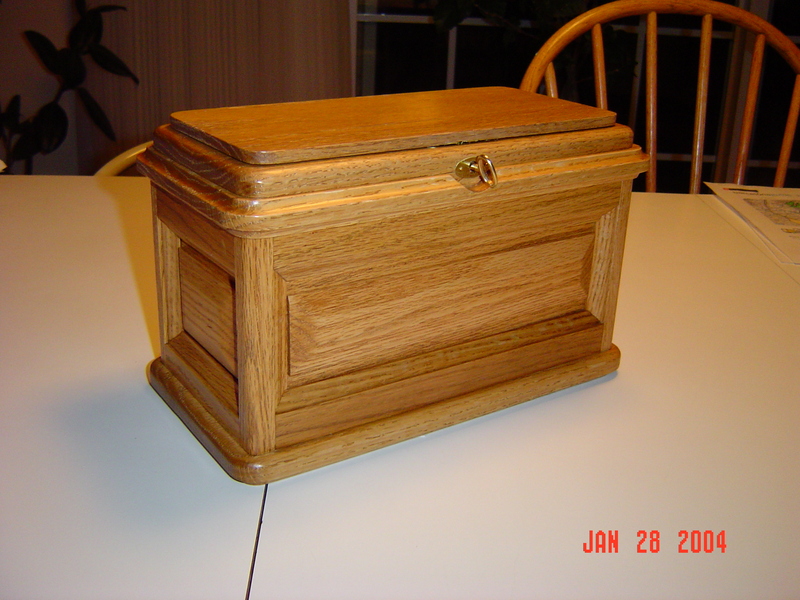 I did not see any designs that I liked so I decided I would replicate the details on the front of the chest. I made two of these this morning. One from walnut and one from white oak. 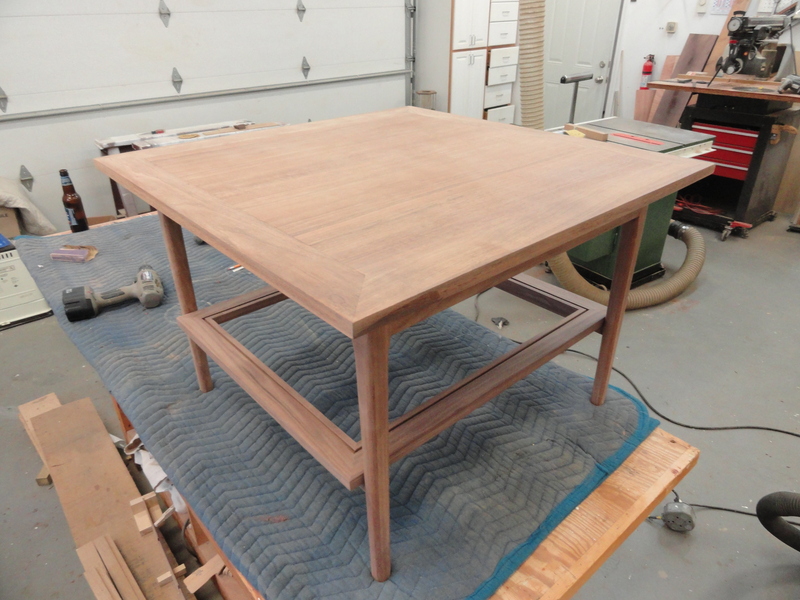 The walnut was too dark and my eyes kept going to the feet every time I looked at it. The white oak is better. 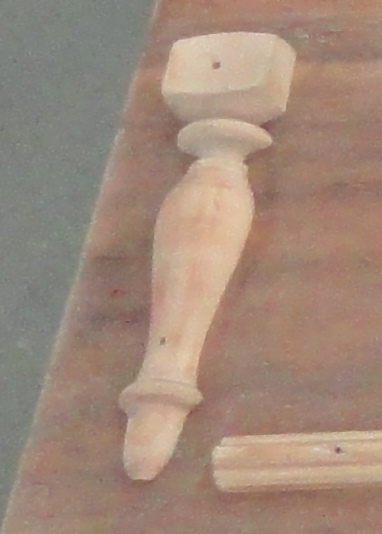 The picture shows the new leg with a beautiful stain on it. 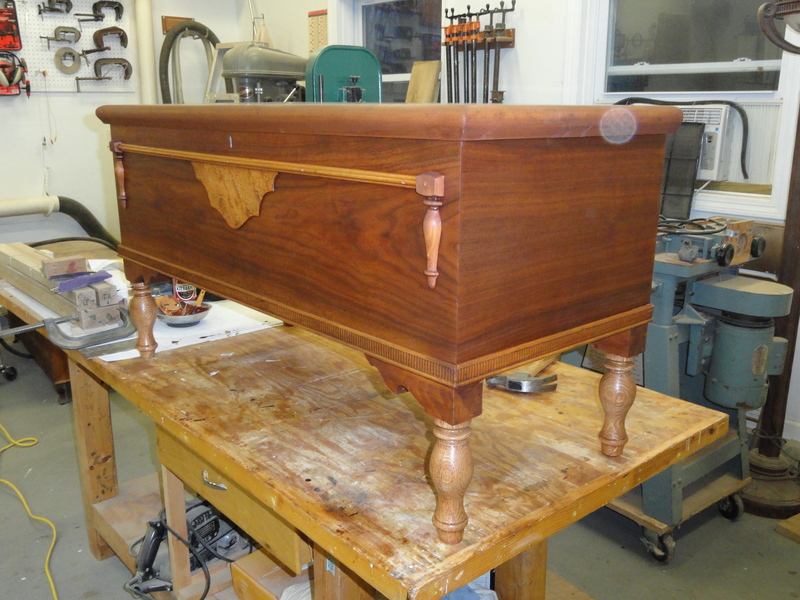 This is the color stain I am considering for the entire chest. I am pretty sure I don’t like the leg design. The square base does not look right to me. I will have to see what my sister thinks. 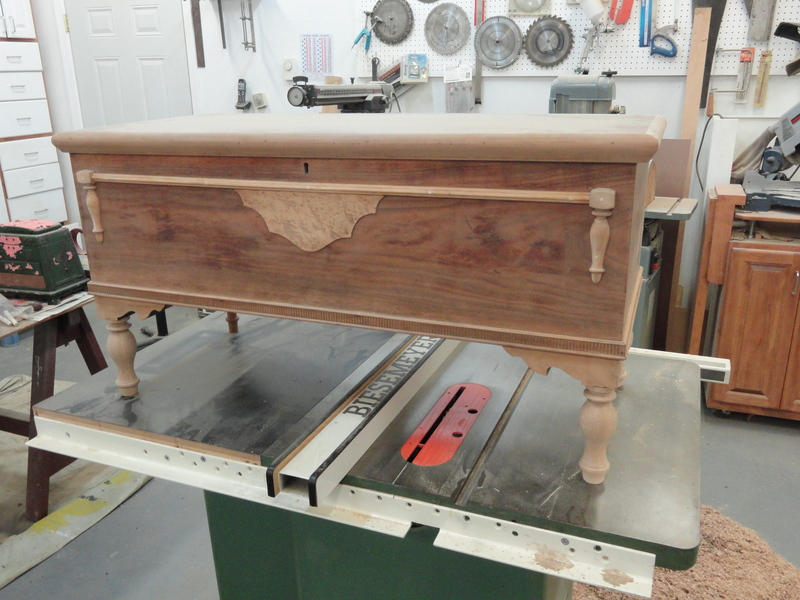 Here is a quick update on the cedar chest. 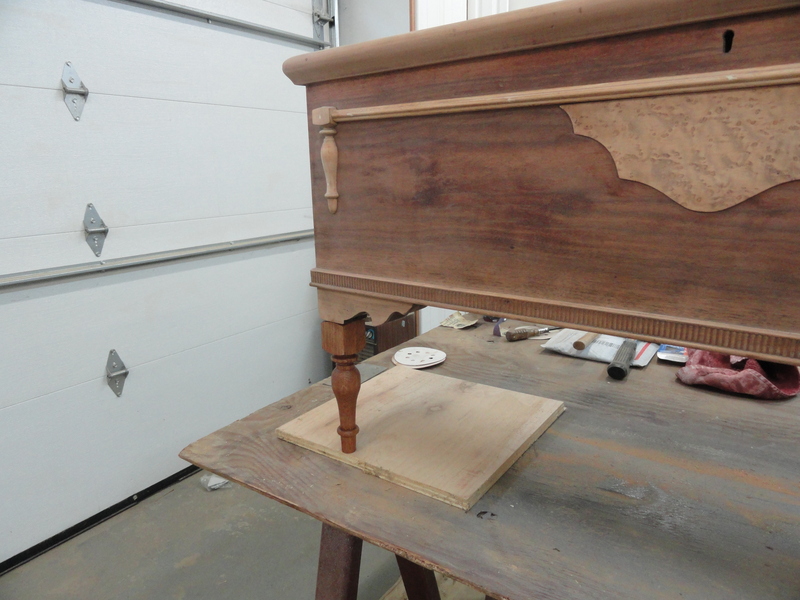 The old finish has been almost completely removed. I have a little work to do to clean up the bottom. 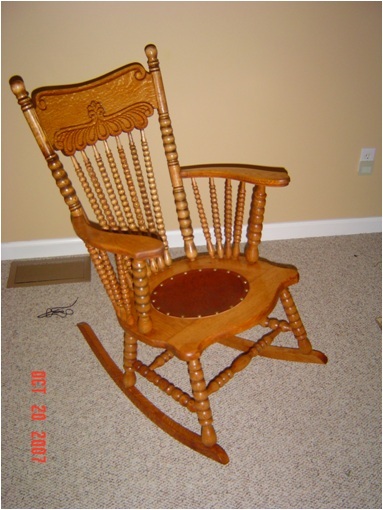 Additionally, after researching the manufacturer, we decided that I would replace the missing legs. 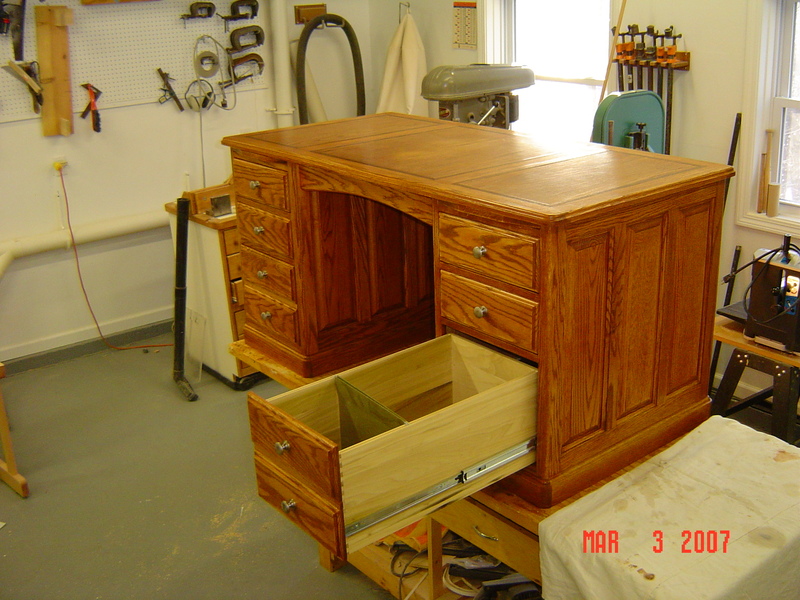 Quite frankly, some of the pictures of cedar cabinets I found on the internet have unattractive legs. 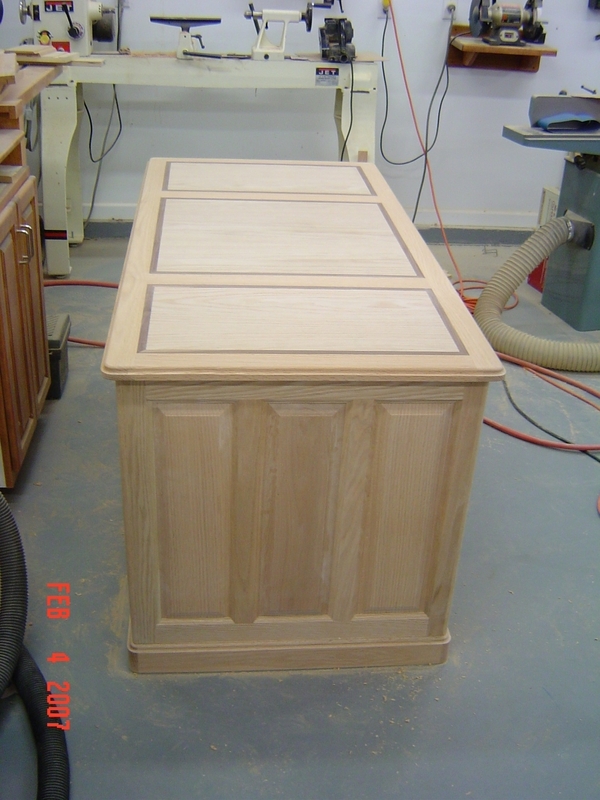 What I proposed to do is to make legs that are similar to the design of the detailed spindles that are on the front of the cabinet. 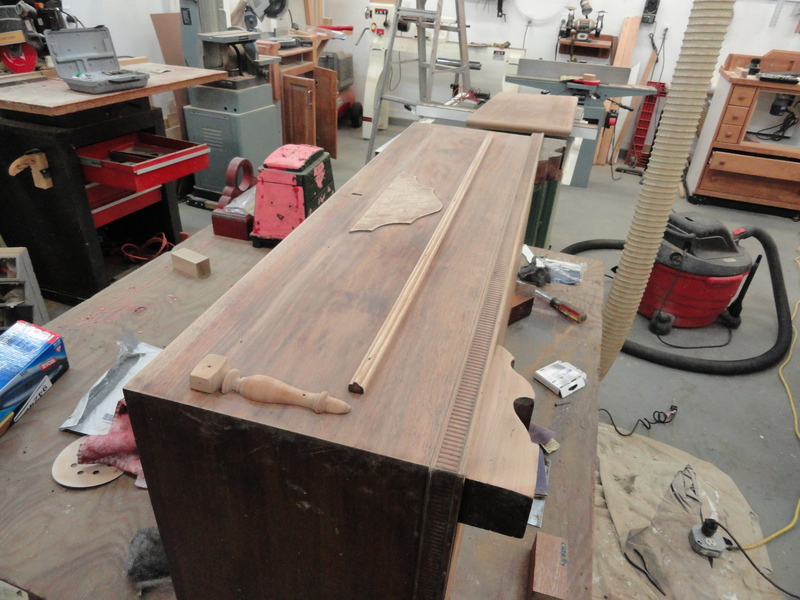 First I will measure the spindle to get the proper proportions. Next I will do a rough drawing using AutoCAD Lite. I will probably make the legs from cherry. That means a trip to the mill. I will be offline for the next several weeks. 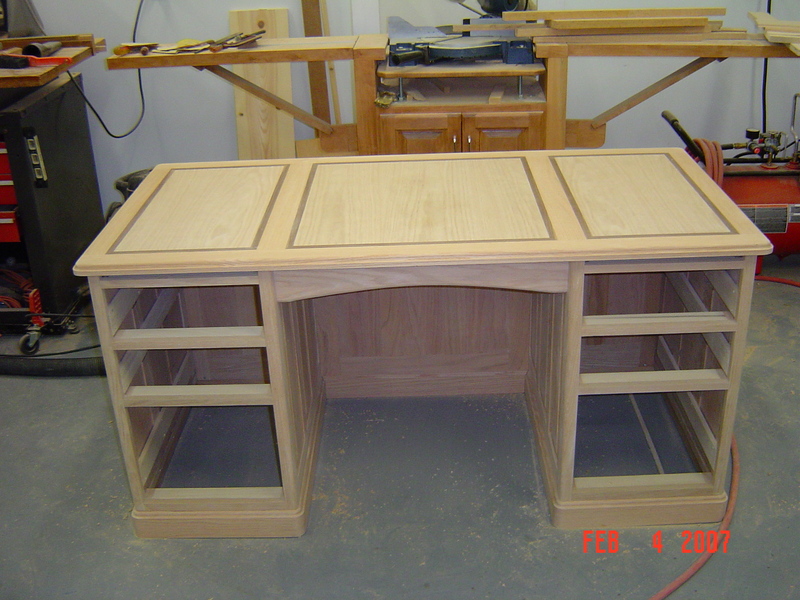 I should be back in the woodshop around the middle of December. More posts to follow. 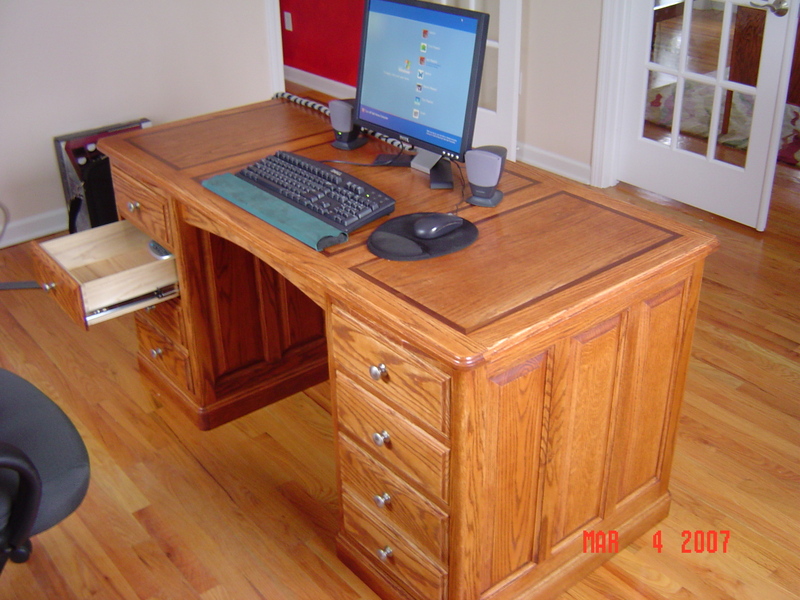 Every woodworker who owns a computer dreams of building his own desk. This is mine. It is actually part of a grand project to redo the library in my house. I looked for a design for some time. 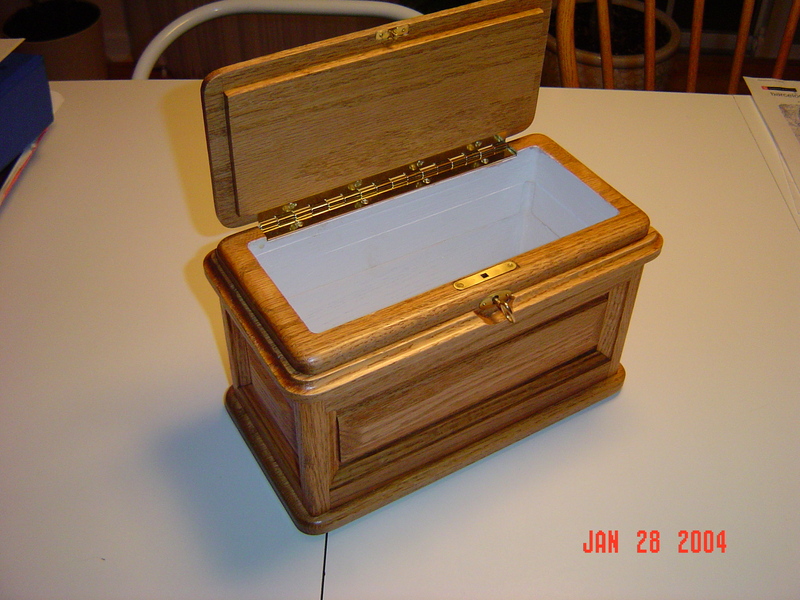 I finally found this one in a woodworking site. I think it cost me $10. I found this new stain from General Finishes. The color is Candlewood. It is a beautiful and deep color. I have used this on many follow-up projects.